At the beginning of July, I went on a not-so-summery holiday to Cornwall. We were a lovely half-hour coastal walk from St. Ives, where I found plenty of delightful tea shops and brilliant bookshops to keep me more than happy on the rainy and windy days when others braved the beach. It was in a very friendly Oxfam Bookshop that I found The House on the Strand. I was about half way through the week, struggling with a book that I wasn’t really in the mood for, and had a sudden craving for Daphne du Maurier. Is there a better place to read her books than Cornwall? When I tried to explain the plot, I was simply laughed at: The narrator, Richard Young is going through a bit of a mid-life crisis and after quitting his job as a publisher, escapes to his old university friend Magnus’ house in Cornwall. He has one week until his wife and step children turn up and his dear friend has asked a rather odd favour. Magnus, a biophysicist, has created a secret drug that can take you back in time by 600 years (that’s the bit where people start laughing) and asks Richard to be his guinea pig. My biggest problem with this book is that it’s just too unrealistic. But however silly the storyline sounds, Daphne du Maurier manages to make it a chillingly serious tale. Time travel is a difficult subject to write about and Daphne du Maurier intertwines the past with Richard’s present life seamlessly, making it almost believable. He walks through the past as an observer, with no way of interacting with the people there. There is an underlying sense of doom as Richard witnesses snippets of past lives with no control. He cannot change the course of history. The feeling of doom intensifies when he is flung back to the present day, with no way of knowing how some events in the past unravel. The lack of interaction between Richard and the characters he becomes obsessed with mean that there is also a lack of connection with the reader. The characters in the past are just names with no real interest attached to them. For me, the present situation with Richard’s family, his odd relationship with Magnus and his growing addiction to the drug are far more interesting storylines. The complicated lives of characters from 600 years ago sound exciting on the surface; There’s love, revenge and murder – all very promising themes, especially from an author famous for creating tension and atmosphere. However, this doesn’t come across except for a feeling of suspense in the present day. And this, du Maurier, as ever, excels at. The growing unease surrounding the sinister drug and Richard’s increasing obsession with the past keeps the reader clinging on to the very end. Even through the good bits though, I still found it difficult to take the book seriously. I couldn’t shift the niggling feeling that the time travel storyline was too unrealistic to take seriously. This isn’t Daphne du Maurier at her best, but then again, it’s almost impossible to beat Jamaica Inn and Rebecca. Ever since I read Diana Gabaldon’s “Outlander” series, I have been interested in time travel books– to the past, not the future. 🙂 I’ve only read one book by du Maurier which is Rebecca. I thought Rebecca was great. You are right, du Maurier excels at creating suspense. 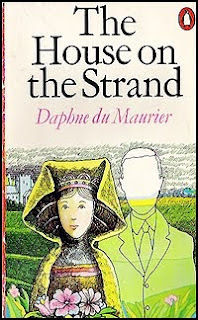 “House on the Strand” sounds like it could have been really good. It’s too bad Richard is not able to interact with the people from the past. I agree that watching is fine at first, but at some point, the reader will want to interact with those characters via Robert. Yeah, I think that’s part of the fun of time travel – getting involved! I’ve never read the Outlander series. I’ll have to look it up! Sounds intriguing, but I might just give this one a miss! Thanks for posting! Haha, I didn’t exactly sell it all that well! It’s definitely worth sticking to her other novels instead if you’re not sure! It certainly is looking at time travel from a different and quite interesting angle. In a way, I’m glad there wasn’t a long explanation of how it all works, like you get in some films, making the whole thing seem more ridiculous. We only know as much as Richard, who isn’t a scientist at all! It’s not my favourite, but Daphne still managed to make me read right up to the end! I swear that, by the time I am an old lady, I will have read and re-read all the Du Mauriers. Even the slightly naff ones. I am slowly building up my collection but struggle with the corny 1980s covers, though they are hilarious 🙂 Have you read The Scapegoat? It’s ACE. Is that the one where there are two of the same person or something? I saw it the other day and almost bought it. But then I thought about all the other books I have to read and decided not to. I’ll read it some day though! Like you, I want to have read all of her books by the time I’m a little old lady!